One of the biggest innovations in the concrete countertop grinding and polishing industry has been planetary technology - machines that have multiple grinding heads, allowing fabricators to cover a large radius of material at a time and achieve an extra-flat result. 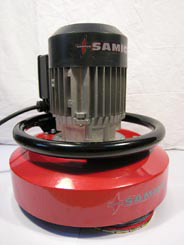 Two big-name grinding tool brands recently released new models that incorporate planetary technology, giving fabricators more options: They are the Legend CT planetary countertop machine from Samich USA, and the DS3011 Planetary Polisher from Leitch/Intertool, which is a new and improved version of the company's DS301. The Legend CT holds three 5.5-inch heads, and according to Samich USA president and CEO Josh Huseby, its balance is what makes it unique. "The motor and gear box, which is the heaviest part, is positioned in the middle, which provides even weight distribution," Huseby says. "It has a high level of stability, and it won't float to one side." It also covers a larger-than-average diameter of 13 inches, and at 50 pounds, workers won't have to apply a lot of pressure while using it, Huseby says. The second machine, Leitch/Intertool's DS3011, possesses all the beneficial qualities of the original DS301 model (a three-head planetary tool designed to grind, polish or clean countertops, floors, walls and steps made of concrete, terrazzo, granite and marble), but takes on a few enhancements that make it cleaner, more powerful and easier to maintain. The new model has triple-sealed bearings, which protect the tool and allow users to simply rinse the machine and allow it to dry as a maintenance routine. Higher torque is achieved via a small pinion gear that drives a larger spur gear, and a built-in vacuum picks up dust when the machine is used dry (it's typically operated wet with a slurry skirt). Plus, repositioned brushes and the presence of cool airflow minimize dust damage to the brushes, allowing them to last longer. A third new tool, the Scarab 5 Head Hand Grinder, contains five three-inch tooling heads that spin in opposite directions, but don't call it a planetary machine. WerkMaster president Brian Wilson describes it instead as an extremely versatile hand grinder that can be used wet or dry and even vertically on walls. Unlike the typical planetary grinder, it fits the bill quite nicely on edges and narrow sections of concrete. "I call it a hand grinder (instead of a planetary grinder) because it's used as a hand grinder," Wilson says. "In this industry, the big challenge is edging. That challenge had to be met with a machine that can do edging, stairs and hard-to-get-to places, which this one does." The machine also comes with a detachable handle, allowing workers to use it on the floor while standing, and it's shaped to reach awkward spots such as behind toilets, along bathtub ledges and around machinery. It's also designed to rest flat on surfaces and comes with a removable dust shroud to minimize dust and debris while used dry.